Kevin DeYoung presents the Holy Spirit as our ultimate gift and outlines the Spirit's active role in our lives. The Holy Spirit is perhaps the least understood, and least acknowledged, member of the Trinity, but his work in the gospel is indispensable. 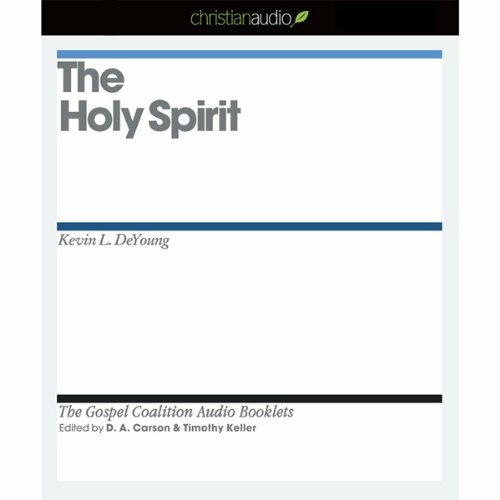 In this new booklet from the Gospel Coalition, Kevin DeYoung looks to Scripture to outline fundamental doctrine about the personhood and work of the Holy Spirit. DeYoung describes the Holy Spirit as our ultimate gift. Jesus promised his followers that a "helper" would be given to them. It is through this helper that we actively experience the power and presence of God. In this booklet DeYoung notes the activity of the Holy Spirit in our lives, including his role in conviction, conversion, glorification, and the imparting of spiritual gifts. The Holy Spirit offers a thoughtful explanation for point 9 of the Gospel Coalition's confessional statement. The Gospel Coalition is an evangelical renewal movement dedicated to a scripture-based reformation of ministry practices. Would you try another book from Kevin L. DeYoung and/or Grover Gardner? I would but I would need to listen to a sample first. I was expecting to hear a lesson on the Holy Spirit actions in our everyday lives, It seems this listen was filled with a lot of scripture which I could have referenced myself. Has The Holy Spirit turned you off from other books in this genre? Would you listen to another book narrated by Grover Gardner? Yes, I enjoy the voice tone and pace. If you could play editor, what scene or scenes would you have cut from The Holy Spirit? Many of the Scriptures I can reference my own bible for that. Maybe the Scriture could've ben listed in th summary/details? This listen left me feeling like I needed more, so I'm going to search ther titles on the Holy Spirit.